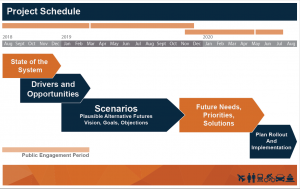 The N.C. Department of Transportation is conducting an update to its long-range transportation plan to help guide North Carolina’s future transportation investments. N.C. Moves 2050 Plan, will provide a 30-year transportation blueprint that meets the needs of a dynamic state, characterized by differing regional priorities, while maintaining a focus on broader, statewide benefits. 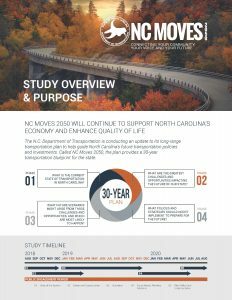 NCDOT is undergoing a comprehensive two-year study that includes identifying statewide transportation systems’ resources and needs. The study team will work with local governments to identify local transportation needs to ensure that North Carolina’s transportation systems keep people and freight moving safely and efficiently to support communities and enhance the state’s economy. Additional information on the NC Moves 2050 Plan is available here. Citizens are encouraged to provide their input via the following survey on the future of transportation in North Carolina.